Nowadays submissions to exhibitions are done online, usually by email with a digital image of your work attached. I’m recommending that the image should be a high-quality scan. If you don’t have your own scanner, you should engage the services of a good imaging service to scan your work. This isn’t always easy. I’ve struggled to find good imaging services over the years and I have experienced the very best and the very worst. I’ve wasted a lot of money on people who lack the skills and experience to produce a high quality scan. A few years ago I purchased my own quality scanner – an Epson V600 for illustration work. It had become too expensive, time-consuming and stressful to get my paintings scanned and emailed on time to meet publication deadlines. This scanner is designed for paintings up to 8.5 inches x 11 inches. Larger paintings I take to a professional service with a bigger flatbed scanner. This is of course more expensive than scans on my trusted V600, but it doesn’t make sense to invest in a bigger scanner for just the occasional bigger painting. There are many scanning services available in most cities but you need to know a few things before you hand over your precious painting. Not many have fully experienced staff who will know exactly what you need. Beware the ones that tell you that you have to pay extra to have the scanned image ‘colour corrected’. This simply means the operator does not know how to create scanner settings to capture your work well. You’re then required to pay someone to ‘correct’ poor scans that do not match your original. An image captured from a hand-held device like an iPhone or iPad or even a digital camera is simply not good enough. It will not secure the finer and more subtle details of a painting. The most telling signs of a non-professional image is the greying of corners or parts of the image background as seen in the image on the left taken with the latest, high quality camera in my iPhone. The image on the right was processed on my scanner with no colour correction required. I hope these images speak for themselves and that you will not waste time on an amateurish image of your work. You want to give your entry its best possible chance with the jurors. Be warned that experienced jurors can also tell if you have ‘tampered’ with a scan in Photoshop trying to clean up your careless edges or doing sundry other touch-ups. Submit an untouched, quality image in a 300 dpi file 8 inches in height. Remember too, if your painting is selected, the submitted image will be used for the exhibition catalogue. You want it to look its best anywhere it’s shown. Finally, some imaging services will encourage you to have a digital image taken with a high- quality camera with a professional lighting set-up. Not only is this an expensive alternative, but I’ve had mixed results with it. 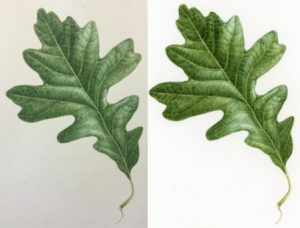 I found that the colour interpretation was not accurate and the detail level was so high that the paper texture and stray graphite marks were visible. This excessive degree of detail is distracting.